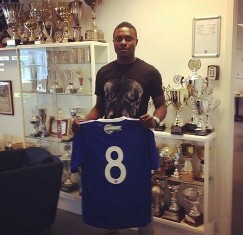 Former Warri Wolves star Oke Akpoveta is presently in fine form, with three goals to his name in four appearances for Swedish club Frej, and he has set himself lofty targets for this season. The striker was not pleased that Frej threw away a two-goal lead to draw 2-2 against Degerfors on match day three in the Superettan on Saturday, especially after he put his team 2-0 up in the 33rd minute. “Regarding the game, I was a bit disappointed with the result. We started very good in the game but we came out too quick in the second half,” says Oke Akpoveta to allnigeriasoccer.com. Akpoveta spent the first half of this season at Lyngby before transferring to Frej in February 2016.